Lightness, chroma and hue are the characteristics on the basis of which all natural shades can be uniquely defined. 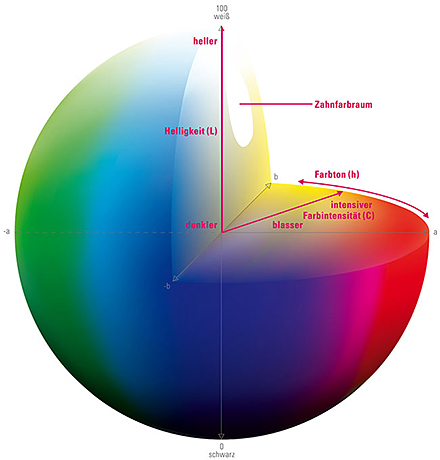 The entire color spectrum can be represented as a sphere, which is effectively a globe of colors. This contains the range of natural tooth shades and forms a small section in the yellow-red range. Colors can be uniquely described in quantitative fashion by specifying numerical values for the three mutually independent elements of L (lightness), C (chroma) and h (hue). 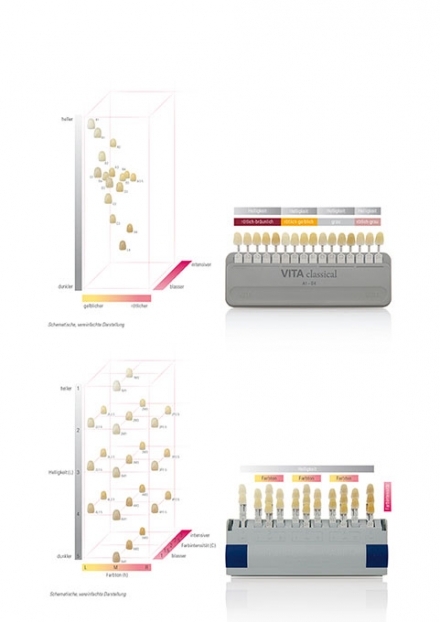 On the basis of this scientific knowledge, VITA developed solutions for tooth shade determination and communication that provide a crucial foundation for laboratories and dental practices in order to facilitate dental prosthetics that offer precisely the right shade for every patient. For patients, this plays an incredibly important role in their individual feeling of well-being. The route to the right tooth shade must be a reliable one. VITA classical A1–D4®. A simple yet effective basis.